If there is parmigiano, there's feta! Yes, I'm talking of cheese varieties. Feta is just one of the food people would acquaint to Greek kitchens with, while the latter is from Italy. With astounding archaeological sites, islands of extreme beauty, bucolic villages and some of the greatest food you’ll ever consume, Greece is on every serious travelers list (and also my dream travel, written in BOLD letters on my bucket list). But for now, let me just savor it's cuisine ever present in the metro. I've read a couple of write-ups about a restaurant in San Juan that serves authentic Greek cuisine. I had an unlucky try at one of the "Mediterranean cafe" so I had been setting aside the idea of trying another one. However, when I heard that Greeka Kouzina had branched out in SM Aura, I told myself that I'm not repealing anymore. Greek cuisine is simple but full of flavor. Greek recipes make use of local fresh ingredients and olive oil. Greek food is often accompanied by a little wine. That is why Greek cuisine is considered an example of the healthy Mediterranean diet. It's a mix of old tradition and influences form other Mediterranean countries and with modern twists. 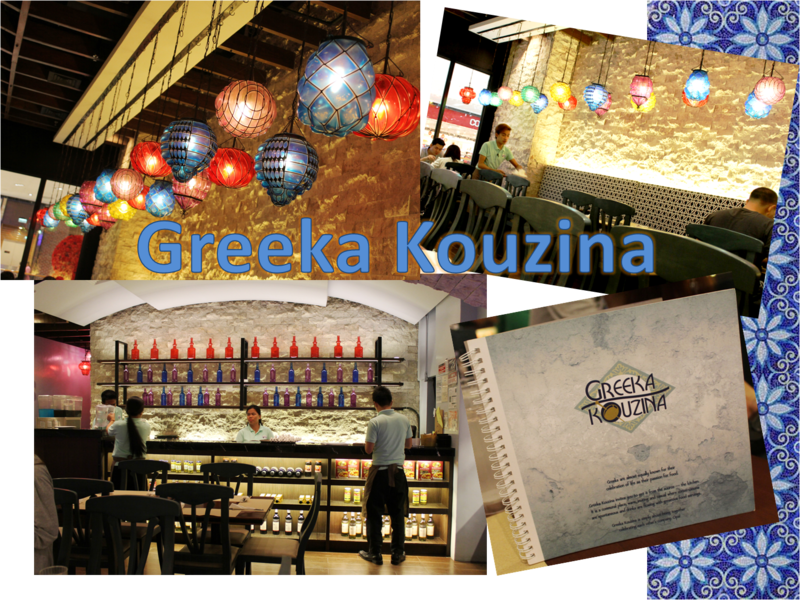 At Greeka Kouzina, dishes are served colorful and hefty, always enough for sharing with family and friends. Four of us foodies began dinner with Fig Roka Salata (P 420). I'm not a true-blooded vegetarian, but I'll always choose a gourmet salad over a block of non-palatable slab of meat, and this choice of salad is spot-on! My companions actually were looking for a dressing that might have come with it. I first dug in and found that the vinaigrette was already mixed in. When we usually mean "salad”, in this case salata, we tend to imagine a bowl of greens with slivers of carrots and peppers and other healthy stuff nestled among the leaves. But imagine, crisp, fresh mix of romaine, iceberg lettuces to rockets (also known as arugula) melded with what made it stand out above usual norm of eating salads are ingredients that made it real Greek in nature- slivers of walnuts, figs and sun-dried tomatoes. I've read somewhere that Greek have a penchant over their regional tomatoes, thus the sun-dried tomatoes gave it a little zest to the whole bed of veggies, all topped off with parmesan cheese. The carnivore session began when plate upon plates of meat dishes were laid to our Greeka trapézi (table). For appetizer we had Kalamari Tiganito (P 290) served with a wedge of lemon and something like a yogurt-dressing. Nothing spectacular about this battered squid deep fried in oil to a crisp. However, the dip seemed to accentuate the simply seasoned yet rubbery textured seafood. Their eísodos (entree in the English-speaking gourmands' term) proved to be promising. When the wait-staff came with a plate of Paidakia (P 595), Greece' version of lamb chops, we all were in awe. First, the aroma was overwhelming and so enticing albeit the oils around the lamb cutlets. Paidakia is actually a delicacy (so I've read) where lambs are marinated with oregano, lemon juice, herbs, thyme and pepper and then grilled at a high temperature until they are well done (no pink meat allowed), usually over a charcoal fire. They are generally accompanied by patates tiganites (the Greek version of French fries), a combo that's as irresistible as it is cholesterol-raising. Let me put a slight break to our meaty rendezvous with Watercress Pasta (P180) which apparently was served together with Beef Souvlaki. Honestly, I was taken aback when I saw the jiggly fresh semi micro-greens on top of a well-cooked pasta with cream sauce. And do you know that watercress is a cousin of broccoli, cauliflower and cabbage? It was my first time to have tasted it as well. It actually left a bitter tang on my taste and the strangest of taste like that of the arugula (I'm not a big fan of arugula though). 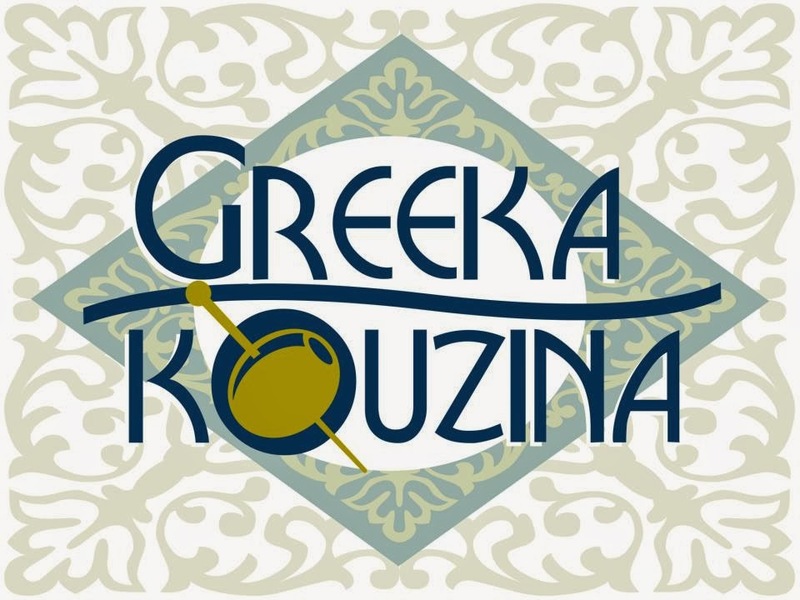 Their menu is an expanse of meat traditionally prepared by how a typical Greek cook would do it at their own Greek Fat Kouzina. One famous beef dish is the Beef Souvlaki (P 430). This gorgeous beef kebab was cooked right through the center of the big chunks of beef. Though cooked very well done, you can still notice that the meat is tender and juicy. Alternately skewered with tomatoes, bell peppers and onions, they have always been the diners' favorite in any Greek resto available in the metro. The sheer oregano (Greek) taste is what sets it apart from other Mediterranean kebabs. This next meat dish looked like our typical fire-grilled pork chops, until you sink your teeth into it. Krasates (P 480) may also be simple, but elevated with compound butter on the top. 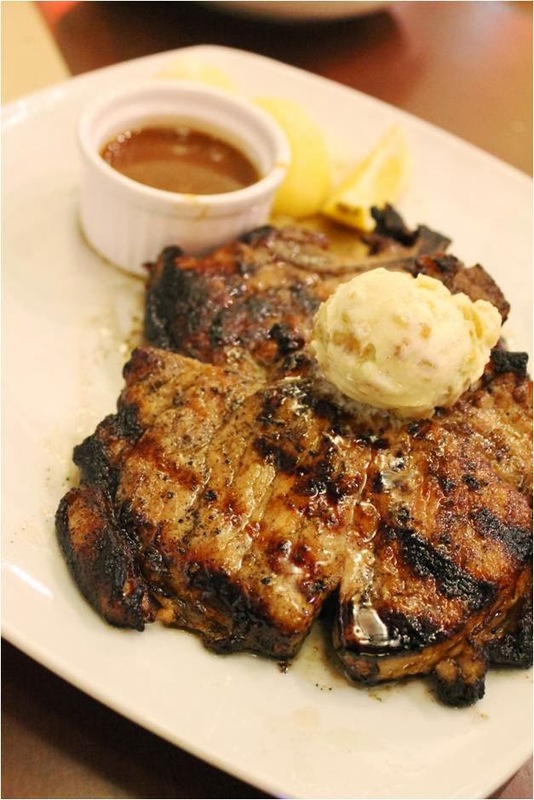 The garlic-infused butter can make a slight difference in the meat Filipino food genre, but Greeka's are more flavorful, though your chewing workout will probably be useful here. The meat dishes were paired also with Moussaka (P 180), I was actually hoping for their Couscous and some pita breads. But their Moussaka have proven it's worth to be included in our menu for that said dinner. I'm not sure if this was a staple in Greek homes, but I don't mind having it everyday. Preparation however is laborious, since it's a layered dish which requires several techniques including baking. The layering consists of fried eggplants at the bottom where the cheesy bechamel was poured over and topped with feta cheeses before baking. I consider the last food feature as a reward for us foodies who conquered traditional meat-endowed meal. Check out these pretty foodistas capturing every details as we reach the finality of a much-deserved Greek try out, Roch of rochkirstin.com and Hana of dollhana.com, also with us was Aldous of Aldous Ate the World. 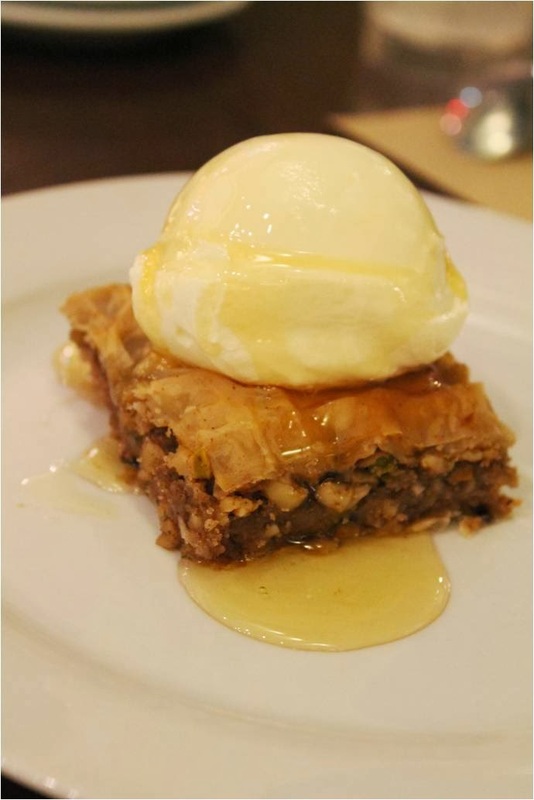 What a divine Goddess dessert Baklava (P 180) is. Well-sugared chopped nuts are sandwiched in between two sheets of filo dough. Unlike other bars which are sliced after baking, Baklava is sliced first, making the process really absurd. Once cooked a slice is topped majestically with authentic Greek yogurt then drizzled with rose-water steeped syrup. I love the transfusion of the syrup and the yogurt but not to the point of being impressed. How I wish they have more options on the dessert menu though. But of course, I would prefer going back with my family.